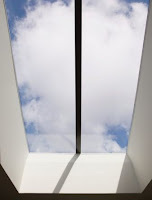 Did you know that there are no depth limitations for skylights? Only limitations on the area (32 sq ft) need to be considered. Skylight is defined by Webster as "an opening in a house roof or ship's deck that is covered with translucent or transparent material and that is designed to admit light." 8.6.7.1 Except as provided in 8.6.7.2 and 8.6.7.3, sprinklers shall be required in all ceiling pockets. (1) The total volume of the unprotected ceiling pocket does not exceed 1000 ft3 (28.3 m3). (2) The depth of the unprotected pocket does not exceed 36 in. (914 mm). (3) The entire floor under the unprotected ceiling pocket is protected by the sprinklers at the lower ceiling elevation. (4) The total size of all unprotected ceiling pockets in the same compartment within 10 ft (3 m) of each other does not exceed 1000 ft3. (5) The unprotected ceiling pocket has noncombustible or limited combustible finishes. (6) Quick response sprinklers are utilized throughout the compartment. 8.5.7.1 Sprinklers shall be permitted to be omitted from skylights not exceeding 32 ft2 (3 m2) in area, regardless of hazard classification, that are separated by at least 10 ft (3 m) horizontally from any other unprotected skylight or unprotected ceiling pocket. 8.5.7.2 Skylights not exceeding 32 ft2 (3 m2) shall be permitted to have a plastic cover.